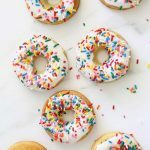 This blog post covers all about food coloring including the best food coloring to buy and how to mix colors into frosting and icing. 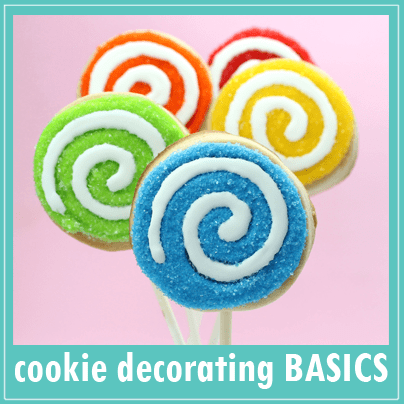 Once you have a handle on food coloring, be sure to check out all of my posts on basic cookie decorating. Because the icing is so essential in a perfectly decorated cookie, the food coloring you use when cookie decorating is just as important. There are plenty of options out there, many of them superb, and you may use a brand and method totally different from mine. But I’ll share what I use and do with the disclaimer that this isn’t comprehensive, it merely works for me. At the end of this post, I included a COLOR CHART you can print on 5 x 7 photo paper, if desired. what is the best food coloring for cookie decorating? 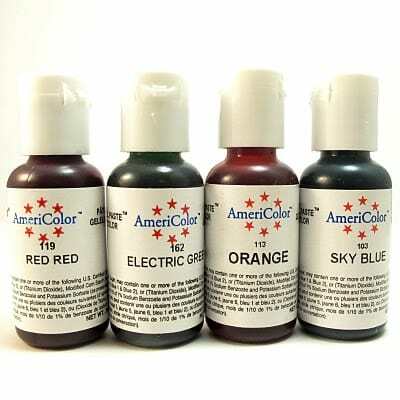 Americolor Soft Gel Pastes (You’d think I own their stock, but I promise I have no connection to the company other than as a customer, and they have not paid me to write this.) Another brand option is Ateco Spectrum food coloring, also very good. Soft gel paste are tasteless, blend beautifully, and come in many colors. You can find Americolor soft gel pastes at many cake decorating supply stores. Americolor Soft Gel Pastes are also available on AMAZON: Here is a set of 12 Americolor food colorings that’s a good start. I also use a lot of the Electric colors. And I buy the big bottle of White food coloring. Americolor sells over 40 colors. I don’t own all of them. I’ll let you be the judge of what colors you like best, of course, but here are the colors I own and use frequently. Some great colors are missing from my collection, but pretty much everything I need to decorate works with these colors, so I rely solely on these below. Click on each for link. which size food coloring to buy: the pastes come in small, .75 ounce bottles, and larger, 4.5 ounce bottles (and even larger, but I think those are wholesale). Even with all the decorating I do, I buy the .75 ounce bottles. 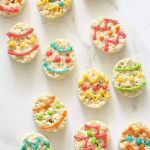 A few drops go a long way, so stick with these unless you have a business and decorate hundreds of cookies a day. Some colors take lots of drops to get the right shade, so you may consider the larger size if you decorate a lot (for example, white, black, brown and the darker shades of any color). You can add coloring to batches of buttercream frosting, to royal icing, to fondant and even to cake and cookie batter before baking. —–Always start with ONE drop and add more as needed. While some colors take a lot of drops, you can always add more, you can’t take it away (if you do go too far, add more frosting to lighten). —–How much to color? For whole batches of icing or frosting, add coloring to the mixing bowl and mix with the mixer. But when making colors for cookies, I usually work with 3/4 to 1 cup of icing for each color, mixing in small bowls. —–For different shades, simply add more drops. These take a LOT of color, so just keep adding drops. More than you’d think. 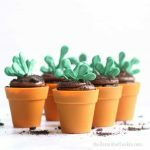 You may want to get bigger bottles of darker color or purchase more than one if you have a lot of icing or frosting to make. Also keep in mind that a lot of food coloring may thin your icing, so add additional confectioner’s sugar if necessary. —–Dark colors, red and white. Dark colors and red, like white, take a LOT of color, so just keep adding drops. More than you’d think. You may want to get bigger bottles of darker color or purchase more than one if you have a lot of icing or frosting to make. Also keep in mind that a lot of food coloring may thin your icing, so add additional confectioner’s sugar if necessary. —– Skin tones. Caucasian flesh is always a tough one to get right. I usually make it with ONE drop ofAmericolor “Peach.” Just one drop. Mayyyybe two. You can also add a touch of Egg Yellow. For African American and Hispanic and/or Latino skin tones I use a different number of drops ofAmericolor Chocolate Brown. For Asian skin tones, I use a mix of Chocolate Brown and Egg Yellow. Just be sure to start with ONE drop of each and add more as needed. —–Color mixing. Mix colors for different effects, such as egg yellow and leaf green for chartreuse or purple and royal blue for cornflower. —–Fondant. 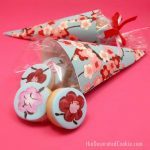 To mix colors into fondant, add a couple drops to a palmful of fondant and knead well. If the fondant gets sticky from overhandling, let it sit at room temperature for 15 minutes or until easily pliable. —–Brown is tricky. Even using Chocolate Brown, it takes a lot of drops. Tan is a tough color to get, as a few drops of Chocolate Brown tend to look pink-ish. I add a drop of Egg Yellow to achieve a better tan. —–Pastels. I add a bit of White coloring to Sky Blue, Electric Pink (I use Electric Pink for all shades of pink rather than Soft Pink as I feel it’s more vibrant), Egg Yellow, Regal Purple or Leaf Green to get my pastels. 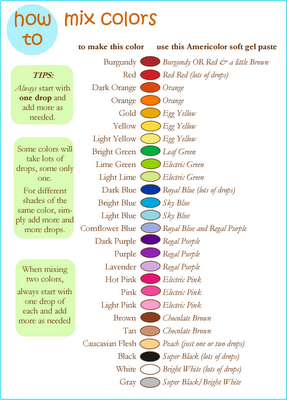 Below is a color chart with more tips on which pastes I use for which frosting colors. Again, this isn’t comprehensive! There are plenty more options. Click on the chart to enlarge and or CLICK HERE to print on 5 x 7 photo paper with your color printer for a postcard to keep for reference. can I use gel pastes with white chocolate? 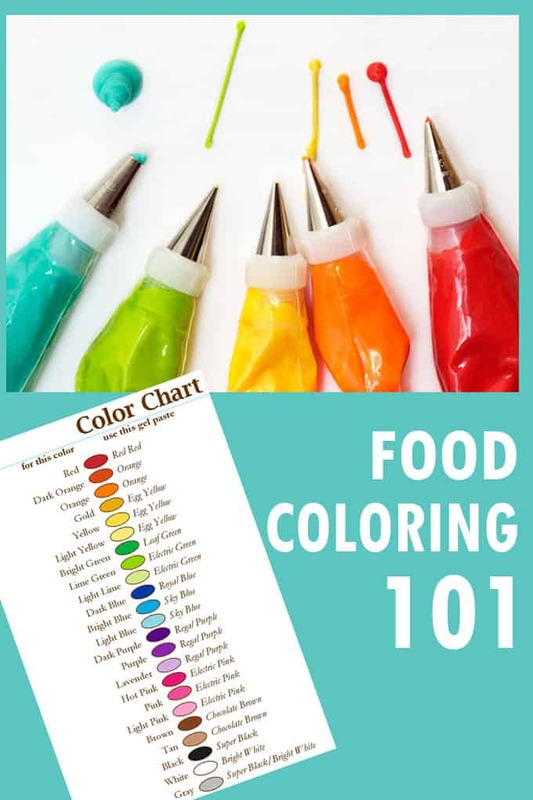 Have you seen seen oil-based “candy color” food coloring in the craft store or cake decorating store, and wondered what is so special about this food coloring? Oil-based candy colors are specialty food coloring for CHOCOLATE and CANDY MELTS. If you use gel paste food coloring to try and color white chocolate or white candy melts, the chocolate will seize. So the answer is, NO, you can not use gel paste food coloring with white chocolate and candy melts. how long will food coloring last? Phew!!! Looks like I’m in the clear…. This post is GREAT!!! And thank you for posting the "real" picture of your colors! When I saw this first "perfect" picture, I was feeling a little food coloring guilt! I'll definitely be linking to this post in the future. Great post! 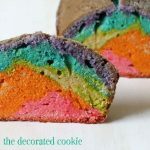 I've been using Wilton coloring for my cookie biz, but think I'm going to bite the bullet and invest in some Americolor! Thank you! such a great post!!! so helpful! Can these be used with white chocolate without ceasing it. Great info. Thanks. I have only used Wilton and have been wanting to try Americolor. I will buy a set on my upcoming trip to the states. Also bonus points for the Beryl's link for international shipping! Yay! So hard to find good food coloring in Germany. Now I have an alternative. Great information! Thank you. I do have a question about the Wilton paste food color. I purchased a bottle of pink a few months ago and when I used it for frosting it gave the frosting an odd flavor. What are your thoughts on this? Joan, while Wilton products overall are great, their pastes (which are the concentrated pastes I mention above) have a metallic, bitter taste. There's nothing wrong with the one you got, that's the downside of those products. 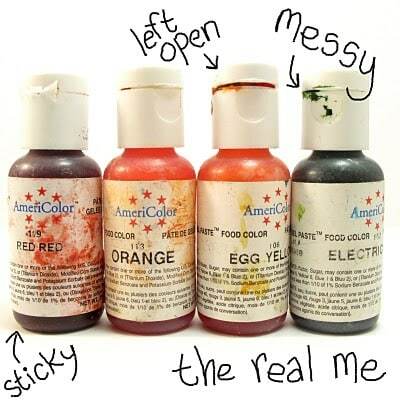 The Americolor soft gel pastes have no taste… that's why I love 'em! (Except for colors you need tons of, like black or red, you can sort of taste it then, but it's not very strong). They are a tiny bit pricier and harder to find, but totally worth it. Thanks so much! This is so helpful and extensive! Thank you so much for the information! One more question, what is the shelf life? I would purchase the smallest bottles. Thanks again for a wonderful and educational post!!!! Good question Joan. Hmmm. I've had some of my (even small) bottles for, yikes, several years now and still use them. That sounds somehow wrong, even though they still look great. I'll email Americolor and ask them! wow this was a SUPER helpful post! I love Americolor. I usually order from Into the Oven at http://www.intotheoven.com. Great post! I love the mixing color chart…awesome! thanks so much for this post. i especially love the color mixing chart. i've only used the wilton food coloring and now i know where that odd taste is coming from! i am definitely using the americolors from now on. Oh, and I also wanted to note that I don't think you can use it for candy melts… but there is a product they sell that makes them work in chocolate…it's called flo-coat chocolate coloring agent. Hi! Thanx for your post! We don't have good food coloring in my country, so now i'm looking for as much info on Americolor as i can to order it on ebay or wherever. I just have one question. And i'd be very greatful if you could help me as! Are the usual colors of Americolor soft gel pastes BRIGHT enough? But i'm not sure if i should buy "electric" colors only or usual ones would be enough to get those bright colours. Lucysd, if you are going to get bright colors, it would be from soft gel pastes like Americolor (you might need a lot of it). The Electric colors definitely. Looking at the pic you sent, I'd say: Electric Pink (for both the red and pink), Electric Orange, Lemon Yellow, might want to mix Electric Green and Leaf Green, Sky Blue (do they make an Electric Blue? Not sure, but if so, that'd work), and Regal Purple, unless they have an Electric Purple. Thanks so much for the amazing resources and tips. I actually found the food color at Hobby Lobby for $1.18! I'm looking forward to your new book. Can't wait! I am very much an untrained amateur and make character cakes for my children's birthdays. After much trial and error, I discovered Americolor last December and love it. Easy to use and beautiful colours. Thanks for the colour mixing chart – that is just so useful for me – I'm printing it now. I'm sure there are others, but these are the ones I use. Thanks Janice! I get lots of people from outside the US asking for resources to buy Americolor, and I never know where to send them. Now I have an Aussie link. 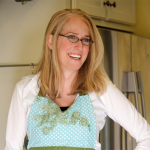 great info, question: after you make the colored royal icing, how long will it be good for? In theory, if you keep the colored icing in the bags or in sealed containers, it should last a couple weeks. But after a week or so, it CAN start to break down, especially icing on the thin side. Thank you for this tutorial. 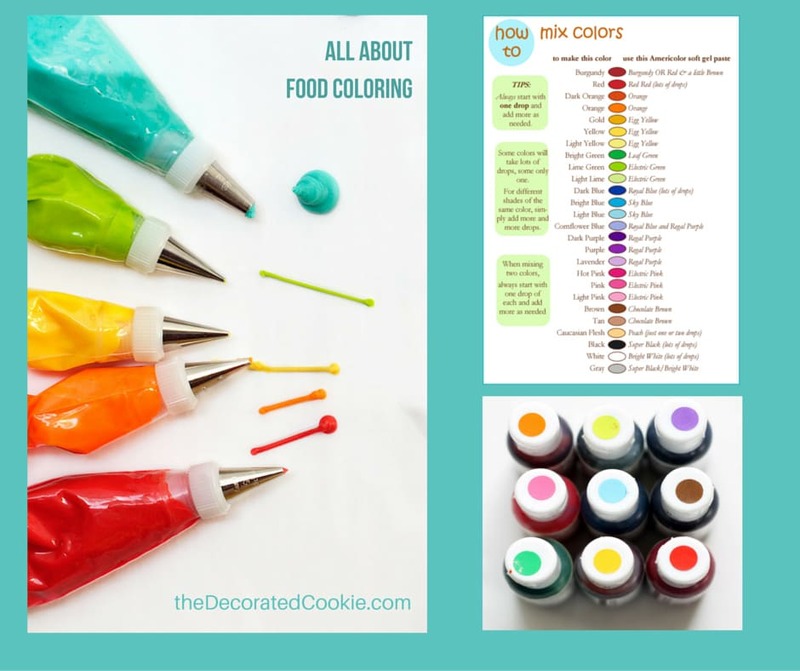 I have used the Wilton colors for years and always wondered about the taste… I thought I was doing something wrong! I decided to look online tonight for colors for Christmas cookies and found that the only baking supply store in my town ONLY sells Americolor pastes! I am so grateful for your informative review. It makes me feel more confident with my upcoming purchase. Thanks so much for your excellent info! I was going to try your vegan cutout cookie recipe, but my daughter just passed her allergy test yesterday so she can have dairy baked into things. So I’ll try your regular ones. Thanks ARC! 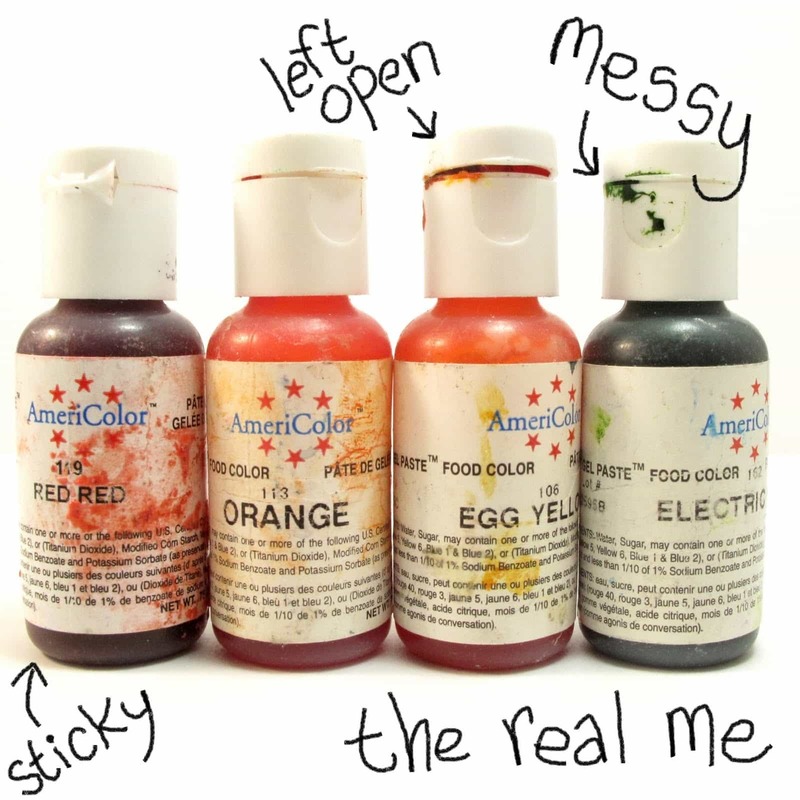 I totally agree about Americolor. Yay for your daughter passing her allergy test! do you know were can I buy samericolor in San Francisco? 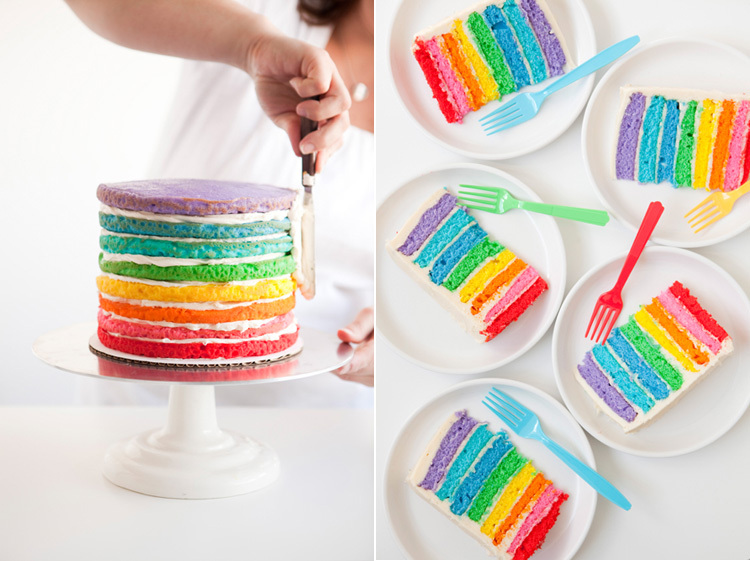 Americolor is CA-based, so more local cake decorating stores may carry it. I also hear the chain, Hobby Lobby, carries it, if there are any near you. Sur la table MAY carry it, but you’d have better luck at a cake decorating specialty store. You can also check the americolorcorp.com website and click under “links.” There are tons of resources there. Thank so much for posting this!! I bought this without doing any research and I am so pleased with what I’ve read and I can’t wait to start using it. There isn’t much on how to use this food color out there so it’s appreciated! Can I use the Americolor soft gel paste for coloring hard boiled eggs. I have done that, Liz, yes! Thanks, Meghan! Do I also add vinegar?? If you’re dying the hard boiled eggs without the shell, use water, not vinegar, though. I am reading this 2 years after the initial post and am going out tomorrow to a store in Salt Lake who carries them. I hate the bitter taste of some coloring and it is fantastic to find some without that. Thanks! Thanks, Patrice! And two years later, I’d say exactly the same thing 🙂 ! I am going to make the switch to soft gel pastes. Great post! Thank you. Does anyone ever use marshmallow frosting with paste food colors? I like the frosting better because it’s not so sweet, but it only gets to soft pastel colors with cheapy drops. I was wanting to try something different for my son’s birthday on Sun. Definitely Loretta, I’d try these! They make such vibrant colors. please i need to know the difference between the soft gel and the electric colors of americolors? and both can be used for icing, fondont and white chokolate? Hi! I bought just about the entire Americolor gel family (lol) but every time I use them, my icing dries very crumbly to the touch (it literally crumbles off the cookie) and I can’t seem to get the colors to come out right. I’m adding them in after the Royal icing is fully mixed. Has this ever happened to you? Anyone ever have problems with taste of the pink gels and/or dark pink color specks showing up on pink cookies? Any help or insight appreciated! Hmm, I haven’t seen specks, anyone else? My Electric Pink sometimes kind of clumps though. And when I paint with it, it separates into granules a bit. I wonder if there’s something in that color. Do you use Americolor? I shake super duper well first and stir like crazy. I know it’s been a while but I just wanted to say that I have problems WITH PINK ONLY with specks!? It’s crazy. I have no idea what it is. Have you ever figured it out? You know what Beth, me too!!! My Electric Pink clumps sometimes. I have NO idea why! I will replace that one more often than the others, assuming it just doesn’t last as long, but it does still clump. Don’t get the science behind that one!! Can you use these gels for cake batters? Yes, Veronica, definitely! I have done that. I read that someone was asking about coloring for candy. I just checked and Americolor does make oil based candy coloring. Oh really??? I didn’t know that. Love Americolor, I’ll definitely use their oil-based coloring. Thank you!! I just bought the Wilton starter kit for cake decorating. I tried to use the thick red that came with it, and it gave the ugliest pink. Calamine lotion would have looked prettier. It was not bright or happy. It was a dusty rose. I was adding it to homemade buttercream. Should I have added some not-included whitening? Thoughts? Hi Latonya! I add gel paste to cake batter just as I would color icing. For red, I just add maybe 4 or 5 drops (or until desired shade). May I ask the difference between americolor’s electric kit and assorted kit? I’m kinda confused. Hi Boomy, It’s just a difference in the shades of colors. 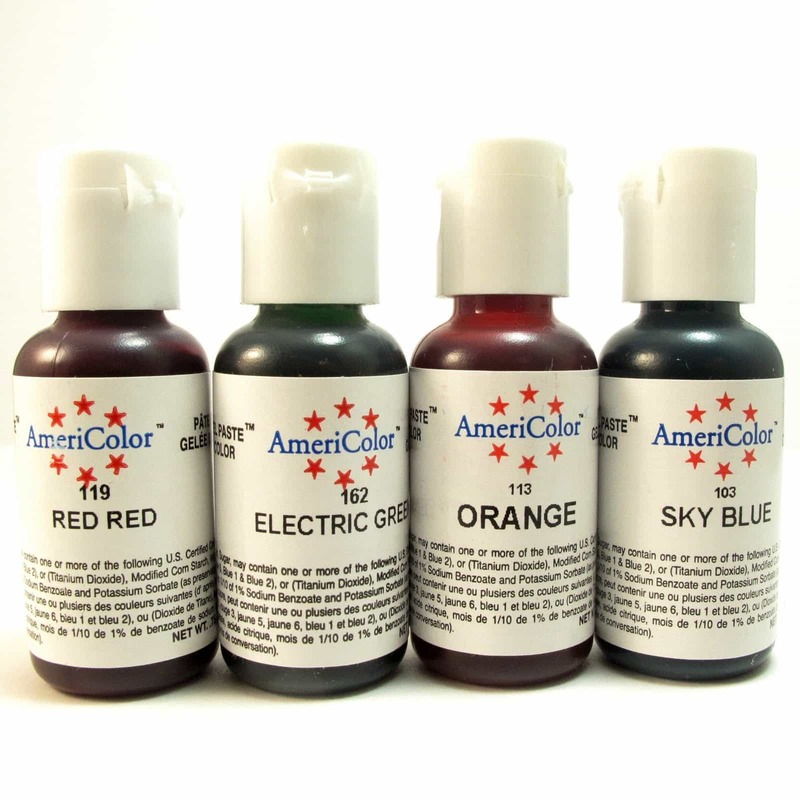 Americolor has tons of options, so it’s really your preference. The Electric colors are more vibrant. I’m a big fan, but the assorted may have more basics. I tend to buy individual bottles. My favorite colors are: Super Black, Bright White, Chocolate Brown, Electric Pink (I just like that instead of the “Soft Pink”), Red Red, Orange, Egg Yellow (I prefer to the “Lemon Yellow” or Electric), Electric Green, Leaf Green, Sky Blue, Electric Purple (vs. Regal Purple). I purchased the AmeriColor in Regal Purple and the taste is horrible. Do you think it could be a bad batch or is it normal to have that bad taste? I bought it recently at Hobby Lobby. I have other colors and none of them have any flavors. This purple makes me gag it’s really gross. Oh, yikes!! I think maybe the batch. While the stronger colors MAY have a slight taste (black, red, even purple) if you use a lot, lot, lot of drops to make a dark color, it shouldn’t be any different than the other colors. If it’s that bad, I’d take it back to Hobby Lobby. Or, even write to Americolor (their website is Americolorcorp.com). I’ve had great luck with the customer service at Americolor! Hi! I just wanna ask how long can I keep using those food coloring? I have quite a few and it doesn’t say the expiration on it. Thanks. I actually called the Americolor company once because I was curious, too. Kept in a dark place (ie not in direct sunlight), they last for several years. I’ve had some of mine for about that long! have you made the following colors and if so which colors did you start out with and what proportions of each? This is for a wedding and I don’t have any swatches to match. Hello. This question was probably already asked and answered but is the AmeriColor soft gel paste perfect for coloring candy melts? I plan on coloring white candy melts so I can have colored cake pops? 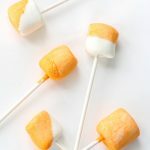 The fats in candy melts tend to resist regular food coloring, so they are NOT ideal for coloring candy melts. You should use special food coloring just for that purpose. They are called “candy colors” and they should be available in the craft store (though your color choices will be more limited). Hope this helps!! Thank you Meagan so much for responding back so quickly! I purchase the 4 color Wilton Candy Color Set. Will this work for coloring white candy melts? I tried to look for a product that would need the flo coat. I just wanted a simplier way to color my white candy melts. Yes! Those are the ones I have, too, for coloring candy melts, so they should work. Sometimes adding coloring can harden the candy melts a little more quickly. So if you find that’s the case and you need them runnier for dipping, I often (almost always) add a teaspoon or two of crisco when melting to make it runnier. I meant to say I tried to look for a product that wouldn’t need the flo coat. Oh wow, that’s such a good question Delynn! I have no idea how I’d figure out the lot number/date, BUT I have contacted Americolor directly and they are super-responsive! I bet they could tell you exactly. If you go to their website: http://americolorcorp.com/ and scroll to the bottom, they have a 1-800 number listed. I think that’s what I called to find out the other info! Can I just say Delynn… you ROCK!! This information is fantastic!!!! I’m going to do exactly the same and also go through the colors I have. I have tons of REALLY old ones. This is great, thank you!!!!!!!!!!!!!!!!!! Ooh, Denise, I would love to know how it works on wool! I’ve never tried dying anything but food. Hi…please temme the difference between AmeriColor Soft Gel Paste Food Color Cake Decorating Student & AmeriColor Soft Gel Paste Food Color Cake Decorating Electric Sets? Can we use both for frosting/icing/whipping and fondant? I wanted to buy online?please help me and clear my queries.Thanx in advance. Hi Geetha, I’m not sure what colors each set contains, but they probably both contain the same KIND of food coloring (which means, they would both work for frosting, icing and fondant), but the difference would only be what colors you get. Looks like the Student set would be good for beginning because it has all the basic colors you might need. The electric set contains their brighter colors. But they are all the same in terms of how they work. I tend to buy colors individually because I have my favorites: Super Black, Bright White, Chocolate Brown, Red Red, Orange, Egg Yellow, Electric Pink, Electric Green, Sky Blue and Electric Purple. But that’s just preference. And you can get them all on amazon! 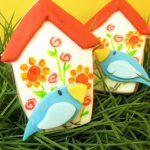 I’m new at decorating royal sugar cookies. It’s a hobby when your stricken with MS! I made some beautiful royal icing sugar cookies for Thanksgiving to take to my daughters house. Unfortunately I wasn’t able to go. I sent the cookies over, so they could enjoy them. They were all amazed I could make something that professional looking. They could hardly wait to eat one. I received mixed reviews. They were in awe how beautiful they were, but didn’t like the taste AT ALL! I have to agree royal icing cookies are eye catching, and festive, but I would never ever crave one of those cookies! I followed the recipe to the t. The cookies taste awesome, but the icing is so bad it’s hard to get down. I just can’t understand how these nice bakeries sell thousands of them. I would sure appreciate all the feed back on this. It’s sad because I love, love love decorating them, but I’m embarrassed to give them a way. I’m positive they would trash them. Can you tell me why some people say that royal icing cookies are so delicious! I like the Americolors. By the way, they are peanut and tree nut free (who knew that some are not?). But I need a good neon color, and the electric pink just doesn’t do it. Any suggestions? Are they really Lisa? I had no idea some aren’t! That seems sneaky. Have you tried Americolor’s Fushia? I think that’s a little more of a neon-esque pink! I have referenced your chart many times. I have it pinned on Pinterest. My cousin is getting married and he and his bride chose “Champagne” and “wine” for their colors. Wine I get (burgundy). But what is champagne? Is that gold? Is is cream? I’m making butterfly cookies for the bridal shower and I don’t want to ask for a swatch since it’s just the shower (not the wedding). What do you suggest? Ha, Beth, go you!! I forgot that answer and I was just racking my brain trying to think of the answer! Especially if they have more of a metallic color (that’s tricky unless you get gold lusterdust). Also, if their invite has the colors or if they have swatches in helps immensely to have those in the kitchen when mixing up colors. Aaah, Valerie, great question. Adding light colors on top of dark (black is the worst culprit) often leads to that frustration. There are a few things you can do that have helped me, but never a total guarantee. One, I don’t thin my icing too much. I know it’s useful for flooding, but I keep it as thick as possible to still achieve a smooth(ish) look. The more water, the more bleeding. Second, I find Americolor pastes hold up well, but it’s in its nature to bleed, so even the finest food coloring will bleed. Third, I let the background dry completely, sometimes overnight, before adding the detail on top. Fourth, I serve within a day or two. Freezing cookies usually works super well for me, but if there is a light color on dark, the risk of bleeding in the freezer is greater. And even without freezing, using the techniques above holds off the bleeding, but after a few days, it may start, so I don’t make them too far in advance in that case. Overall, the best thing you can do is tip 3: Let the black icing dry super duper well first. It doesn’t work for wet on wet techniques, but is the best way to prevent bleeding otherwise. Hope this helps Valerie!! Thank you for the post., Can you use the Americolor Gel Paste with Wilton Fondant? According to Wilton, you can only be tinted with icing colors (from them of course). I am new to working with Fondant, so sorry if it seems like a silly question. I don’t want to fondant to seize or fail. Not a silly question at all! Yes, you absolutely can use americolor gel pastes with wilton fondant. I do all the time. In fact, that’s my exact coloring-fondant combo. I sometimes use Satin Ice fondant, but Wilton is more readily available in my craft store. Wow this is great info. I use to decorate cakes a lot and have a lot of old colors of assorted brands, thought recently I’d throw them out and get some new ones that aren’t so messy to touch. lol My frustration with the Wilton colors has been in initially removing the foil from the top. Do the Americolor gels have a tab or something to help remove it? I have ended up trying to poke a hole through the Wilton ones with something and still can’t get it removed as it has a tough plastic under and I just make this huge mess. I get that they need to be sealed tight but really?? Thanks for any advice. Oh my gosh, Karen, that’s my food coloring pet peeve too!!! I end up jamming scissors in there and have the same problem. Americolor DOES have covers too. In theory they have sort of edges on the side you can grab, but it doesn’t always work. Hence, my jamming of scissors. Grr! 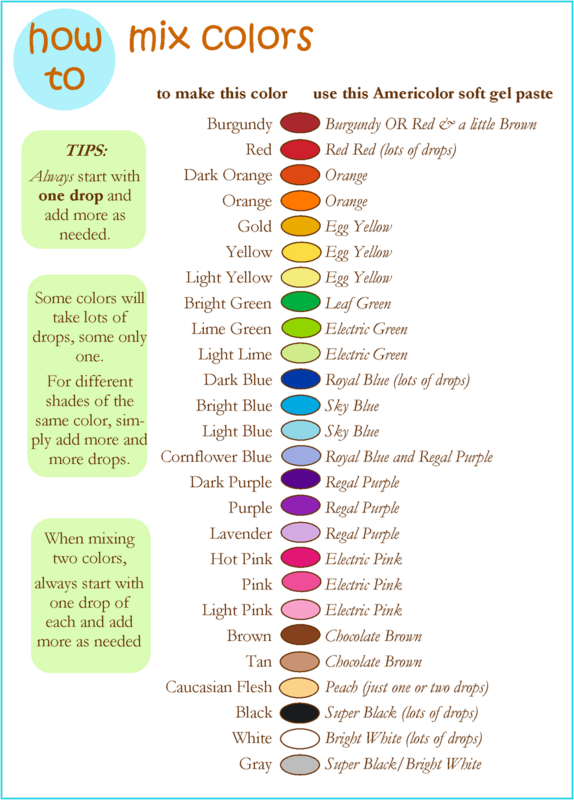 Just found your page, thanks for sharing this awesome info, I have a question, may I use this colors for glazed cookies? You know, powder sugar, milk, and escense base glaze…? Hi Isa, Yes! Absolutely. 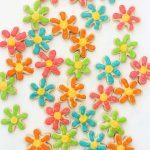 I use the gel pastes for every combination of icing/frosting, royal, buttercream, glazed… It works beautifully! Hi Gloria, The gold will be more of a mix of orange and yellow, NOT a metallic looking gold. To get a real metallic gold, you’ll likely have to use more of an airbrush/spray thing. Americolor does make a true gold airbrush color. Hi Teto, I’m not as familiar with Chefmaster products, so take my answer with a grain of salt. My guess is… very little difference. Both are the right choice for coloring white chocolate. Overall, I’m a big fan of Americolor products, so I tend to vote for them, but I think you’d be absolutely good with either, so I’d choose the less expensive/easier to get one. Will the food color expired if I keep it and never use it often? Lori, I had actually asked Americolor directly this question awhile back, and they said that it should keep for several years. (I actually have some that I’ve had for a few years and it works great.) That said, if it’s been exposed to sunlight, the shelf life is much shorter, so Americolor had recommended storing it in a cool-ish, dark place. Have you tried diluting the gels with a clear extract, water or, high grain alcohol? 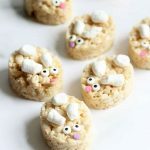 I need a thin almost liquid type for the cookies im making. I am making marble dip cookies and find that the gel is to heavy/thick to get swirled/marbled without mixing it so much that, it mixes too much in the royal icing. It has also caused some spots on the cookie to be heavily concentrated with gel, that you can taste the gel. Out from the oven faded. What can be the reason ? Hi Isha, If you’re adding food coloring to cookie dough, it won’t have the vibrancy of icing or frosting that’s colored, due to the baking process. But you could try adding just a lot more food coloring to see if it helps! This is the best blog post I’ve read concerning coloring! Thank you so much for all the details and handy chart!! Aw, thank you so much Amy! So glad it’s helpful!!! I’ve always used Wilton coloring, so I’m really excited to read this post. My son has requested a Pittsburgh Steelers logo cake and cookies for his birthday party, and the thought of all of that black scared me! I never would have done it with Wilton, it would have tasted terrible! I know I’ll need to add a lot with Americolor, also. But are there any other tips for getting a good black? Hi Sara! Ah, my husband is a huge Pittsburgh Steelers fan! I know what you mean about the black icing. I really do love Americolor and use black a lot (mostly for outlining, not too much aside from logos calls for a larger area of black.) You do need a good bit of the Americolor icing (although you should still be fine with the smaller .75 ounce bottle). Even though the coloring is pretty good about not thinning icing, it CAN thin it somewhat, so I would start with a thicker icing. 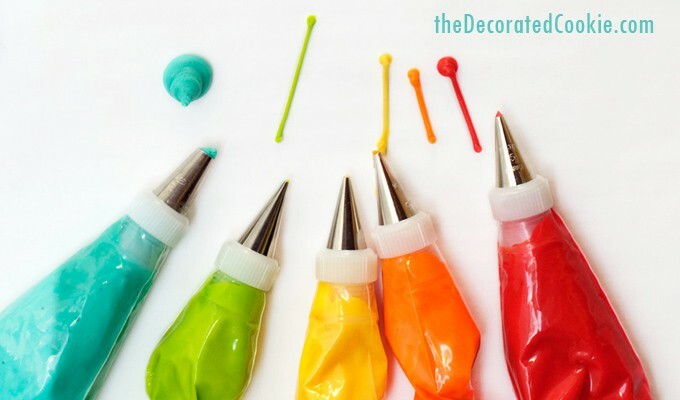 You can always thin it later with drops of water (if it’s royal icing) or milk (if it’s buttercream frosting) if your icing is too thick after you color it.